Pack 002 is chartered by the Legacy Park HOA in Kennesaw, GA. We are part of the Silver Comet District under the Atlanta Area Council. Cub Scouts is a year-round program that offers fun activities that promote character and leadership development. Our program is designed to be hands-on and parents are encouraged to play an active role in our program. Our program is for youth in grades kindergarten through 5th grade. 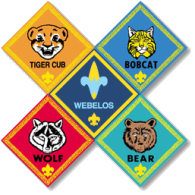 Troop 002 offers Scouting opportunities for youth ages 11-17. Our entire pack meets the first Monday of the month while den meetings by grade level are typically held twice a month. Our activities include hiking, camping, pinewood derby races, summer camps, and more. Please see our event calendar for an idea on all of the fun we have. Please use the Contact Us link if you have any questions. We would love to have you join us for your Scouting journey. March events Please see the calendar and events page for information regarding Blue & Gold and our Spring camp out at Cub Challenge. January & February Please see the event sign up page for details on January's Pinewood Derby and the Cumberland Caverns camp out in February.